In this chapter we will introduce composite components, i.e. components that are composed of subcomponents. As these subcomponents may also be primitive components or composites actually a hierarchy of components emerges. One important reason for creating components out of others is that one often wants to create self contained components, i.e. components with few outbound required services. Self contained components can provide most of their functionality out of the box in varying application contexts. In the first lecture of this chapter we will create a composite component that has several subcomponents. The lecture will show how subcomponents can be defined and how configurations can be used to specify different component setups. As the composite component itself will only used as component container and does not contain functionalities by itself we will use an XML component descriptor (of course we could use a micro agent as well). A configuration is a spcific setting of a component that has a name. At startup of a component the configuration can be selected. This allows to define different interesting setups within one component. In this example we will create a component with two configurations. In the first only one chat subcomponent is created whereas in the second ten chat agents will be instantiated. Add a componenttypes section and insert one componenttype definition inside. The componenttype should be equipped with a name and a filename attribute. The name is used as internal identifier within the component.xml to refer to the defined kind of agent. Here is should be set to chatagent. The filename serves as file location and sould be set to tutorial.ChatD5Agent.class. Create a configurations section below the componenttypes section. In the configurations section place two configuration definitions. The first should be named One chatter the second Ten chatters using the name attribute of the configuration definition. In each of the configuration section add a components section and inside of it a component definition. The component should have the attribute type set to chatagent (or formerly defined logical agent type). In the component definition of the second configuration also introduced an attribute number and set it to 10 (all attributes must be set in quotation marks). In addition to configurations a component can be customized at startup by using arguments. Furthermore, a component can declare results which are assumed to be available after component termination. Taken together, arguments and results can be used for a function oriented view on components, it a component can use a subcomponent in a function oriented way by starting it with specific arguments and waiting it to terminate for fetching the results. In this lecture we will change the component description from the last exercise to include an argument with which we can determine the number of subcomponents that should be created. Create an XML file called ChatE2.component.xml and copy the contents from the previous lecture. Add an arguments section at the beginning of the componenttype definition. Within this section define an argument with name set to chatters and class set to int. In between the opening and closing tag of the argument its default value can be specified as Java expression. Here we just set it to 2. Add a configuration called Argument number of chatters and define it in the same way as the others. In contrast to the others we will set the number attribute of the component description is this case to "\$args.chatters". After selecting the component model in the JCC you should see an input field for the argument value in the Starter panel as shown below in the screenshot. Try out starting without and with entering a number in the argument input field. You should check that the started composite component has as many components as you entered. Be sure to have started the component in the new configuration. This lecture will show how services of components can be directly connected. In this way typically normal SCA components are bound to each other. The use case in this exercise is that we introduce a registry component at which the chatters announce their real and nickname identity. In an application there is one predefined registry component that is made directly known to the chatter agents at startup. Create a new interface called IRegistryServiceE3.java. Add a method for getting the chatter identities named getChatters() and IFuture as return value. Add a class attribute called entries of type Map and initialize it to a new HashMap. Add both methods of the interface. In the register method use put to store the nickname as key and the component identifier in the map. In the getChatters method simply return the entries by new Future(entries). Create a new agent class called RegistryE3Agent.java. Mark the class as an agent by adding the @Agent annotation above the class definition. Add the registry service by adding a @ProvidedServices annotation. Inside of this annotation create a @ProvidedService annotation with type set to IRegistryServiceE3. Inside of the provided service annotation add an @Implementation annotation and assign it to RegistryServiceE3.class. Create a new agent class called ChatE3Agent.java and copy its content from ChatD5Agent. You can keep the service implementation of D5 as we will not introduce new chat functionalities here. Add a @Arguments annotation. Inside create a @Argument annotation and give it the name nickname, the clazz String and the defaultvalue "Willi". The backslash is used because Jadex expects a parseable Java expression and for a String the quotation marks necessary. The defaultvalue is used in case no other value is supplied during startup of the component (e.g. from the JCC or programmatically). Also add a field nickname of type String in the agent class. Above this field add the @AgentArgument annotation. This automatically injects the argument value in the corresponding field. Add a @RequiredService annotation with name regservice and type IRegistryServiceE3.class. Do not add a @Binding annotation inside. Instead we will assign the binding explicitly in the composite component. Create a composite file called ChatE3.component.xml and copy its content from ChatE2.component.xml. In the componenttypes section change the chatagent component filename to the new ChatE3Agent.class. Add a second component definition with name registry and filename tutorial.RegistryE3Agent.class. Delete all configurations except the first one and name it Two chatters. In this configuration add a component definition with type registry and name reg. It is important to set the name of this component as we will use it in the following binding definitions. Create a second component definition by copying the first one and change the component name to chatter2 as well as the nickname to Franz. In the JCC start the chat application (ChatE3.component.xml) and check if it has three subcomponents (one registry and two chat agents). After ten seconds you should see that the chat agents print out the information from the registry (component id and nicknames). The nicknames of the components should correspond to the argument values that have been entered in the component xml, namely Franz and Hans. In case you comment out the argument value for a component it will use the defaultvalue as specified in the chat component itself (here Willi). The expected output is also shown below in the figure. In this small lecture we will create the registry component on demand, i.e. when a chat component tries to access the registry service for the first time and no service provider could be found, it will create one on its own. This kind of behavior is not enabled per default and we need to turn it on by setting the create flag to true in the required service binding specification. Create the component xml file called ChatE4.component.xml by copying the content from ChatE3.component.xml. After startup you can see that the same components are started as in lecture E3. Looking inside the chat application reveals that it has one registry and two chat components. This time the registry is created when a chat agent resolves its required registry service. It is important to note that in this case the name attribute reg is also used for component creation, i.e. the registry gets this name. To determine the model of the component to start the type attribute is used, which is set to registry. In this exercise we will change the system behavior so that the chat agents use the registry to look up the component identifier of a chatpartner's nickname. Using the component identifier we will fetch the chat service of this chat partner and send him a private message. 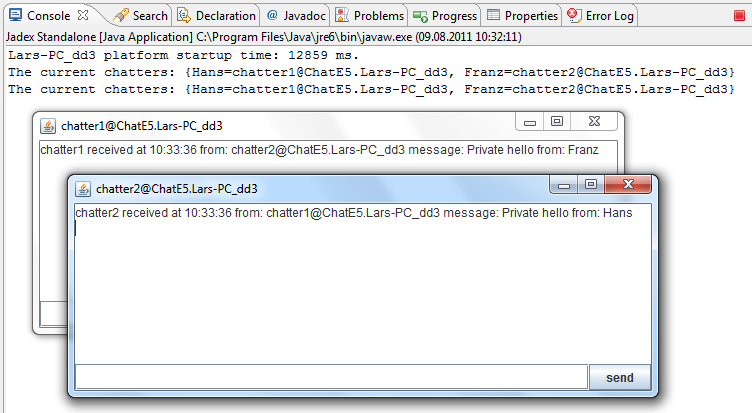 Create a chat agent Java class called ChatE5Agent.java by copying it from ChatE3Agent.java. Add an @Argument annotation in the @Arguments area and name it partner. The type should be set to String and no default value needs to be specified. Add a field called partner of type String in the chat agent class. Above the field declaration add an @AgentArgument annotation. Create the component xml file called ChatE5.component.xml by copying the content from ChatE3.component.xml. Add an argument in the component instance argument section for the partner attribute. For the first chat agent with name Hans the partner should be Franz and for the second chat agent vice versa. Starting the composite component should lead to the following behavior. Both chat agents first register at the registry component. After ten seconds both agents use the registry to determine the component identifier of their chat partner using its partner's nickname (called partner). In the chat windows a private message of the other chat agent should appear as shown below.